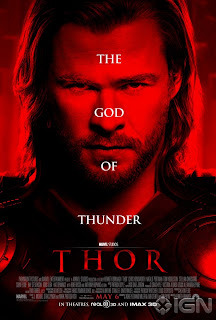 Thor begins with its titular character (Chris Hemsworth) getting hit by a van in the middle of a desert in New Mexico. It's a major departure from the status he enjoys as one of the two sons of Odin (Anthony Hopkins at his most regal), the ruler of a mystical world called Asgard, the home of all the rock stars of Norse mythology. It is quickly made clear that we're not dealing with mere superheroes here. This is a realm of the gods, and an appropriately theatrical one at that: imagine Coruscant with a healthy dose of Versaillies. The problem is that Thor is arrogant. After he provokes a war with the Asgardians' ancient enemies, his father strips him of his famous hammer and banishes him to Earth, thus creating an opportunity for his duplicitous younger brother Loki (Tom Hiddleston) to seize the throne. Director Kenneth Branagh was handpicked to accentuate the Shakespearean undertones in this tale - which he does to a highly entertaining degree - and it's to his great credit that he makes the earthbound scenes almost as compelling. You see, Thor has a difficult time adjusting to a mortal life without the deference he's come to expect. His invective is softened by an encounter with a physicist (Natalie Portman) who is researching the possibility of a portal between the corners of the universe. That she falls in love with her best piece of evidence is simply a given in a film such as this. But I don't mean to suggest that Thor is too lightweight. While it has its weaker moments, at its best it recalls the Richard Donner-Christopher Reeve version of Superman, another tale of an unwilling interplanetary traveler burdened by the troubles of the world he once belonged to and the alien world that he has come to love and protect. Like Donner, Branagh approaches this material with the right balance of action and introspection, with the former often driving the latter. Thor, however, is built for bravado - no son of Odin could ever be described as 'mild-mannered.' And thanks to an overwhelming sense of old-fashioned adventure, Thor is a fantasy as lusty and bombastic as the gods themselves.